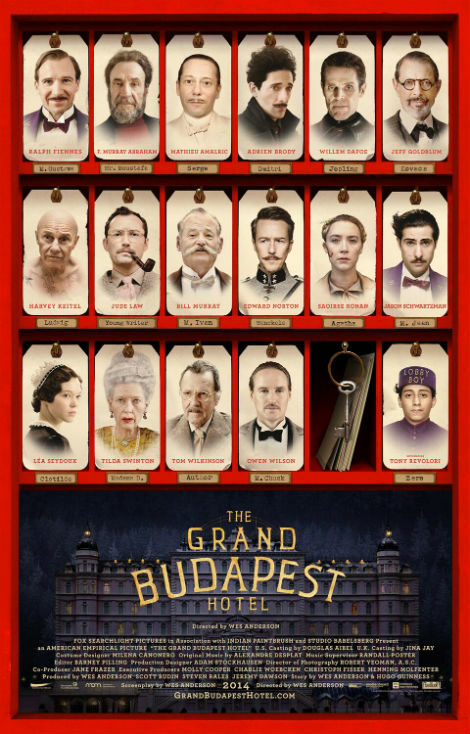 Snowpiercer, The Grand Budapest Hotel and Boyhood are on top of many critics' lists of best films for 2014. So I was curious to see what I could learn about how they made them. I chose these three because they represented the best in their genre so far this year. Snowpiercer - Trailer Making of (Part 1) - Camera, Lighting and Grip Equipment supplied by ARRI Rental from ARRI Rental on Vimeo. Snowpiercer - Trailer Making of (Part 2) - Camera, Lighting and Grip Equipment supplied by ARRI Rental from ARRI Rental on Vimeo. Twitch - Behind the camera you pulled together so many different talents. You brought in a lot of different people you hadn't worked with before...are you just making it difficult for yourself on purpose? Bong Joon-ho - Fortunately I had quite a long pre-production period, enough time to discuss and prepare. My cinematographer was the same guy who shot Mother and the production designer is a Czech guy, who did The Illusionist with Edward Norton, as well as many domestic movies in the Czech Republic. Very long. Almost a year. The production period was quite short, a little bit less than three months, because of the complicated schedules of all the actors, but pre-production was quite long. We prepared many things, so yeah, many new guys, but it was an exciting experience. The costume designer, Catherine George, she worked with Tilda Swinton on We Need To Talk About Kevin. That movie of course is not a sci-fi movie, but I loved her way with characters. Very simple colour and design, but the costumes express the characters, I think, when you're watching the film. Also, Marco Beltrami. I love the soundtrack in 3:10 to Yuma, the James Mangold remake. That music was very impressive and actually it was Marco Beltrami's agent who first tried to contact us. Marco really loved Mother, my previous film, and so we met in L.A.. He's a very shy guy but such a nice man. And our stunt coordinator was a British guy called Julian Spencer (a favourite of Danny Boyle and Nicolas Winding Refn's), who choreographed the fight sequence in the David Cronenberg film Eastern Promises. Yeah. He is the man who did that. You remember the sauna fight sequence is very physical, no weapons, almost body to body. Well that's one thing in SNOWPIERCER, due to the confined space you're working in, the fighting is very close quarters. It just feels so vicious. Yeah it was a great experience working with Julian. I think one of the most striking things in the film is the production design. I love the fact that we don't see any of the train until Curtis and the other rebels see it. They are trying to get through the next door and so are we, and we have no idea what's behind it. Right, only the characters come from the front, like Mason and the strange yellow girl, but the audience can't see the front part. If we did some crosscutting of the tail section and the front part I think it would be very stupid. It also means everything we see in the trailers for the film - this dirty, metallic environment - is really just from the first half of the movie. But after Curtis and the others pass through the water supply section and the greenhouse, everything changes, extremely different colours and moods. How much of the train's design is taken from the original graphic novel, and how much is you saying, "I want this scene to look like THE MATRIX and this scene to look like SILENT RUNNING"? Actually the original French graphic novel that came out in the 1980s is all in black and white. Really? Because there is so much colour in your film. Eventually. Yeah, the most extreme colours are in the classroom section. 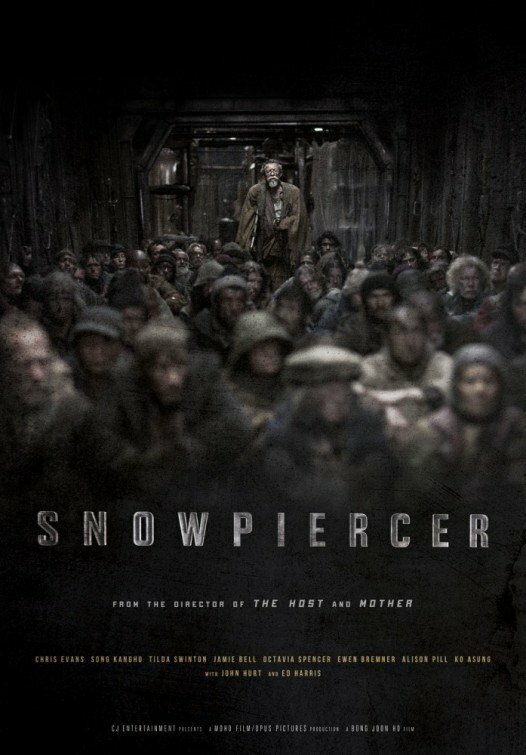 Plus if you want to know about Tarantino's and The Weinstein Company's involvement with Snowpiercer and the casting of Snowpiercer. For the shoot, which took place largely at a converted department store, Mr. Anderson also had no trouble tapping into the eclectic roster of actors who have become his unofficial repertory company: Bill Murray, Owen Wilson and Jason Schwartzman turn up as hotel staffers; Edward Norton plays a police captain and Willem Dafoe a sinister enforcer; and Tilda Swinton, under layers of cosmetics, plays an octogenarian dowager named Madame D.
When Mr. Anderson asked if she’d be up for “a bit of hard-core prosthetics work” and the “full-fledged old-age makeup routine,” Ms. Swinton said by email, her reply was “Count me in” (with an X for a kiss). The actors were offered access to a library that included Zweig’s work and films by directors like Ernst Lubitsch, Rouben Mamoulian and Frank Borzage. They also had the option of watching an animatic (a rough film of storyboard images edited together) Mr. Anderson had made of the entire movie, as he envisioned it, with him voicing all the characters. “I thought: ‘This guy doesn’t even need actors. The film is already made,’ ” Mr. Dafoe said. When did you conceive of the project?Richard Linklater: It happened in stages. In the late 90s, I felt like I wanted to tell a story about childhood. I had been a parent for a while, pushing 40. I had something to say, but it wasn’t fitting into one film. Because you have this natural limitation. You can’t ask a seven-year-old to suddenly be a 14-year-old. So I had given up on it. Then, I sat down to write an experimental novel or something in 2001 and that’s where this idea hit me. ‘Oh, what if you filmed a little bit every year.’ And then I could encompass all these ideas. That was the “aha!” moment. Why did you settle on 12 years?Linklater: Public school, first through 12th grade. The grid that we’re sentenced to. I remember feeling that, like ‘Oh, I’ve got eight more years of this, seven more years of this…’ It also represented getting out of the house. Freedom awaits at thismoment. I knew it would end with him at college. And I knew I would never be bored of this project because it was a deeper well, about maturing, growing up, parenting. There was endless material. Was it hard making the business case for financing the film?Linklater: I talked to some producers and they’re like, ‘Huh? What? We’re gonna pay and not …’ It just made no sense. But then IFC came aboard. I had done two films with them, Tapeand Waking Life. They took the long term view. And it wasn’t that much money, about $200,000 a year. We’re shooting on film. It was very low budget. And they just took the leap. I fully expected halfway through to be abandoned and have to seek other financing. I never had to, though. It’s a minor miracle. Did you have a contingency plan? What if one of the actors gets in a car wreck? What if they get a terrible disease? Was that just part of the risk?Linklater: It was no more a risk than life is a risk, in the real world. The phone can ring and you can get bad news and something can be changed dramatically. But the film had a great faith in the future, in statistical norms. If something crazy happens, we’ll work it in. It was designed to work in who everyone was becoming. I could subtly go with where they were at developmentally. I had these ideas of what would happen but it was always tempered with who everyone was, what they were doing. Was it hard to get back into character year after year? Patricia Arquette (principal cast member): When you have a script, you can plot the arc of your character and make choices. But in this case, we didn’t have a script at the beginning, so when we would talk about the scenes before we’d shoot that year, everyone would incorporate their experience. ‘Well, when my mom divorced my dad, this is what happened. Oh, and this is what my mom did …’. I knew the broad strokes. But we would make an amalgamation of who she was, which wasn’t always pre-determined and defined. Are there any tricks of the trade you used to get that realness?Arquette: It was real by nature. The budget was really tiny. Before we started filming, Rick had me take the kids for the weekend. They had a sleepover with me. We did arts and crafts. I cooked them breakfast in the morning. We bonded like that. And there was nothing highfalutin about anything. Hair and makeup would crammed into like a three foot space with each other, with the wardrobe. Sometimes I’m bringing my own clothes from home or they’ll go to the Goodwill and get clothes. A snotty person couldn’t survive.